Chemistry is more than a university subject and in rugby it cannot be underestimated. Teams who have gone out and recruited big names, like the Highlanders and Rebels, in the belief that names will produce results are finding it is not as simple as that. In a competition like Super Rugby, that is arduous and physically demanding, you have to rely on having enough depth and the right balance and chemistry between players to get results. 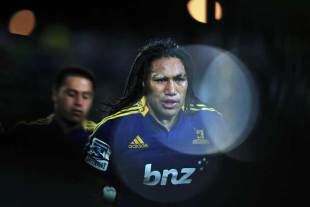 The Highlanders recruited a great deal of experience but not in all the right areas. They have depth in one position, prop, but not in other areas. Losing a player like Adam Thomson in a key position like flanker cannot be underestimated. And that coupled with the loss of key players due to injury earlier in the season will see the Highlanders struggle to get rhythm in their game. They will get players like Tamati Ellison and Nasi Manu back on the field, and the side will get better and win games, but it will be too little too late. At no point have they been able to field their best side this year. The Rebels went for Kurtley Beale, James O'Connor and Scott Higginbotham, but that trio have been unable to improve the standards in an under-performing side. And when you talk about chemistry, the Blues recruited talent but in the vital positions - the key decision makers of halfback and first five-eighth - they suffer from a serious lack of experience. The first selectorial battle of the competition is getting names on contracts. Some teams in New Zealand have won that battle, others haven't. The Chiefs and Crusaders show regularly when they lose personnel they are able to replace them and the chemistry of the sides don't change. The Chiefs, even when they have lost a player like halfback Tawera Kerr-Barlow, are able to replace him with a former All Black in Brendon Leonard. When they were not able to call on Richard Kahui, they didn't have a big name to replace him but they covered that by finding the right balance to compensate for his loss. The Hurricanes are very similar. They are strong in key positions and have great experience in the key areas. Thomas Perenara and Beauden Barrett are the starting No.9 and 10 and then you have Chris Smylie and Tusi Pisi. There is no substitute for experience late in games. When it comes the time to win a close game, the more experienced the player the better the outcome. Chemistry is also important in defence. It is very rare that a team wins consistently without a rock solid and organised defensive system. The Crusaders and Chiefs have been the best counter-attacking sides over the past two seasons. Their ability to regain possession as a result of pressure is a huge part of their success. If you want to win week-in week-out you need the ability to play the game from both sides (attack and defence) of the ball, and the chemistry of the personnel that make up a team is a vital component that cannot be underestimated - no matter how big the reputations are of those involved.